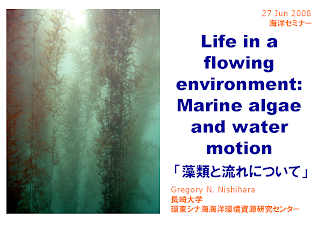 I presented a lecture on my work with hydrodynamics and macroalgae in a combined seminar with Dr. U. I tried my best to make the lecture easier to understand; personally I think it was too simplified. Nevertheless, some people in the back of the room were nodding their heads, so it appears that it was easier to understand. Unless they were sleeping... In anycase, trying to discuss a complicated topic in Japanese is quite difficult. I'll just have to get better at Japanese and find better ways to present the topic. Most of the presentation was from my previous one, except that I added some new data that I recently analyzed. your lecture is wondful,although i can understand all of them.